Exfoliating is a very important step to achieve healthy, glowing skin and we forget that part because most of us think that exfoliating can also harm our skin. In fact, it can , if you are using something very rough and gritty in texture. But , it won’t ever harm your skin if you use a mild scrub which is effective in removing all the dead skin! 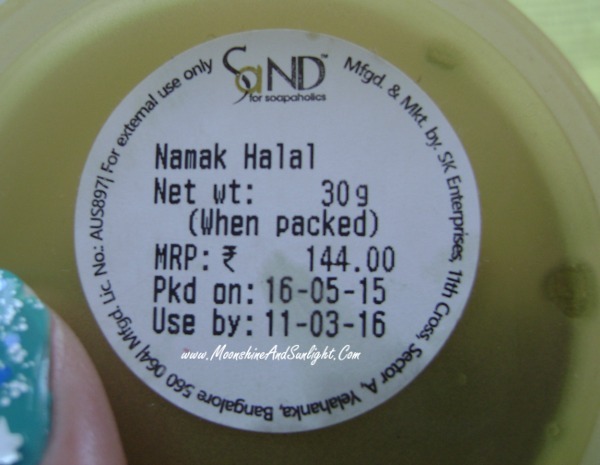 Something like my new favourite from SaND for Soapaholics , Namak Halal. Namak Halal is a mild scrub with Epsom salt and a heady mix of essential oils (which smells so soo relaxing). SaND has one more scrub , which is a sugar base scrub, but that one is more suitable for winters according to me. You can always check the difference out at the SaND stores here in Bangalore before you buy. From this review onwards, I will list out likes and dislikes for the product I am reviewing. I love this scrub because it is very mild and you can easily use this for your face as well. This effectively buffs off the dead skin and the essential oils moisturize, deeply! The fragrance is extremely comforting and long lasting. I do not use any body wash or soap after this; in fact I wash before scrubbing, which is the actual way of doing it, in case you didn't know. I don’t even require any moisturiser after this, which is not something that I do in case of my Fruttini raspberry scrub. This doesn’t foam up , so be rest assured that this is more of a chemical free, DIY kind of scrub. The only thing is that you are not “DIY-ing “ this ! Can be used both on face and body. Mild enough for daily use. This scores an 8 on the meter because of its effectiveness and the fragrance. Have you Tried this scrub ?? What's Your Fav Product from SaND ? ?